“Love’s Affliction” by Fidelis O. Mkparu, tells the story of a young Nigerian man, Joseph Fafa, who goes to North Carolina for his pre-med studies. While there, he falls in love with the beautiful and talented Wendy Crane, who happens to be the daughter of one of the wealthiest and most powerful Southern family in North Carolina. Set in the mid 1970s, when interracial relationships were still taboo, Joseph must overcome not only the cultural differences, but also the barriers that come with a forbidden romance and institutionalized racism. While reading this book, I could not help but remember Nigerian novelist Chimamanda Ngozi Adichie’s Ted Talk, called “The Danger of the Single Story.” There have been countless stories on forbidden romances, some involving politics, some involving superhuman creatures, and some involving racism, but how many of these seem pertinent to these modern times? Mkparu’s novel is moving and hauntingly real. It speaks to not only the racism of the 1970s and interracial relationships, but also to the institutionalized racism of today, and people’s reactions to differences. Emotional and heart wrenching, “Love’s Affliction” leaves me with a feeling of connectedness to other people, not just the characters. 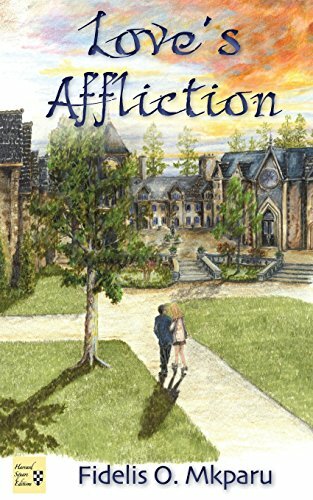 “Love’s Affliction” has a meaningful and relevant plot, is well written, both grammatically, and in the sense that the characters are real people; no archetypes, no stereotypes, but actual real people that I know or could know. Mkparu’s writing shows a level of sophistication and seduction, evoking emotions through his descriptions and prose. In summary, I would recommend this great read to anyone, especially those in interracial or intercultural relationships. As a first generation American coming from an immigrant family, I could relate to “Love’s Affliction” by Fidelis O. Mkparu in a variety of ways. With an increasingly globalized and interconnected world, many others may be able to relate to “Love’s Affliction” as well.